Very good Bunna! Good mix between sherry, wood and smoke! Dried fruits, sultanas, cocoa, sea air, salt, lemon, some ashtray, against later also kelp, grass, soil. Grape juice, wood, some ashtray, salt. Nose: dark sherry, sweet, slightly "dirty" notes, distinct oak notes. Mouth: strong, oak, peat, salt, ash, rather tart than sweet. The nose pretends to be something. A nose close to its neighbor opposite (Isle of Jura) interesting but not extraordinary. A body and a final which astonish by their power: close to the neighbors of the South of the island. 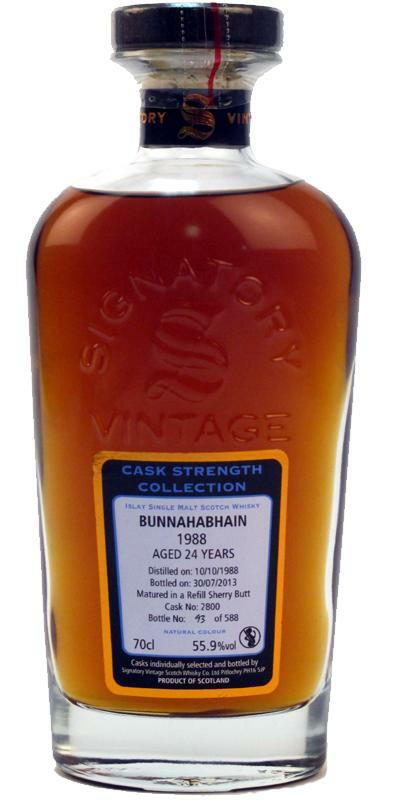 A whisky that hides his game well, with a nose with finesse but a body while muscle. Excellent. Maybe the strong sulfuric note caused some irritation to me, maybe a bigger glas like the now used Spiegelau premium snifter and the adequate amount of water was beneficial. Prima whisky, exactly what I expected at distillery / age / cask / starch, for refill the sherry influence is even stronger than I would have thought.